Anyone else grow up with a love for trail mix or is it just me? 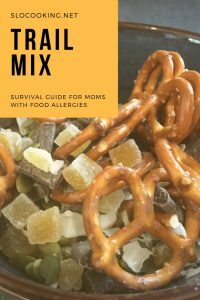 I have fond memories of standing in the kitchen helping my dad measure out ingredients for homemade trail mix to take on backpack trips with his scout troop. 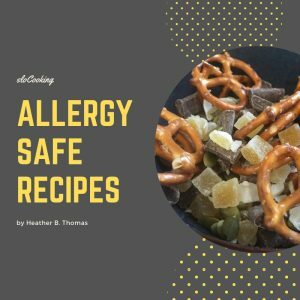 This is my allergy friendly version. The beauty is you can adjust the ingredients to your liking. Don’t like pretzels? Don’t include them. Have a hankering for Cheerios in your mix? Add them! Can’t do nuts? Use seeds. 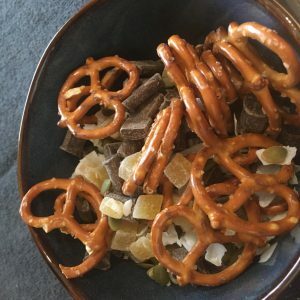 Don’t like seeds and are okay with nuts? You get the picture. I like to mix this up in a big bowl, then portion out in ¼ – ½ cup portions. When we take trips this is a go-to snack for me to pack. That way I’m always assured that I’ll have something I can munch on if the family stops for an afternoon snack somewhere. Have you checked out my Instagram feed yet?